Analysis: Paul Murphy has always been upfront about his intention to boycott water charges… and has encouraged others to follow suit. 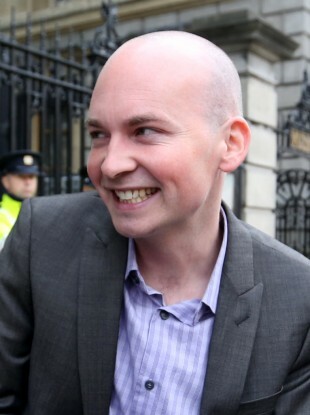 LAST SATURDAY A video emerged of the Socialist TD Paul Murphy telling an Irish Water contractor installing meters in Templeogue that he was “elected to break the law”. The contractor then asks Murphy, who was elected in a by-election last October, if as an elected representative he is refusing to obey the law. Those remarks have drawn condemnation in political circles since they were made public. The Fine Gael TD for Meath East, Regina Doherty said that Murphy had been “caught out”, adding that he confirmed on video “what we have known for some time; that he has no issue with breaking the law. Doherty’s tweet about the story was retweeted by several of her government colleagues including Labour TD Derek Nolan and her Fine Gael colleagues Marcella Corcoran-Kennedy and Mary Mitchell-O’Connor. Fine Gael’s junior environment minister Paudie Coffey said that Murphy was “a very real threat to democracy in this country”. But Murphy’s comments are hardly surprising given that he campaigned on outright opposition to water charges in the recent by-election. In fact, the former Socialist MEP knocked on doors and actively encouraged householders to boycott their Irish Water bills, refuse to return their water registration packs and mount a campaign of non-payment. He was asking voters to break the law and encouraged people to join him and his colleagues in mounting a campaign of civil disobedience. It was the only issue that Murphy campaigned on. As a result, voters in Dublin South-West elected him. When he was elected on 11 October, Murphy told reporters that people “can refuse to pay en masse” and effectively break the law. Murphy instead claims the real story is the leaking of the video to the newspaper and claims it is linked to him raising claims about protesters being intimidated. He felt the video had been released to undermine him, but no one should be surprised by Murphy’s candid remarks that he was elected to break the law. He clearly was and in the video he was bluntly articulating this. Email “Why this TD WAS elected to break the law”. Feedback on “Why this TD WAS elected to break the law”.